David Palmer. Jonathon Power. Gregory Gaultier. That’s the short list of talent that went on to World #1 after winning a Motor City Open trophy. Current World #9, Mohamed El Shorbagy, may soon join them. The talented, 20-year-old Egyptian demonstrated on his run to this year’s title that he has the stuff to compete at the world’s highest level. 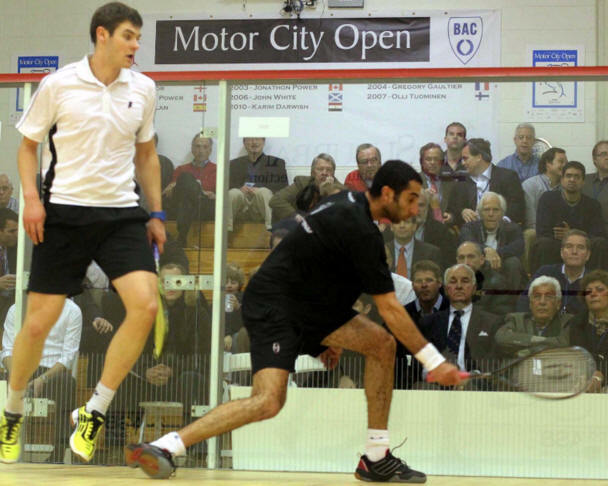 After downing Aussie legend Palmer in the semis, Shorbagy dispatched countryman and World #15 Omar Mosaad 3-1 (8-11, 11-6, 11-8, 11-5) Monday night to win the 12th annual Motor City Open presented by the Suburban Collection. 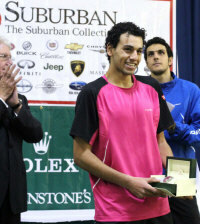 With the win, Shorbagy pocketed the top prize: a $8200 paycheck and a Rolex watch from Greenstone Jewelers. Egyptians currently hold six of the top 15 spots in the world rankings, making for competitive, constructive training sessions back home. It also means the inevitable final between friends who know one another’s games all too well. Shorbagy entered the match – the pair had split two previous meetings - with a plan to work the long game, to exhaust the 6’3” “Tower of Power” and - once fatigued - to close him out with the short game. The pace of Game One was indeed torrid with both players firing hard rails mixed with daring drops. But Shorbagy’s speed, fitness, and exquisite racquet control began to take its toll. By Game 4, the personable Egyptian was joking with the referee, his confidence swelling as the finish line loomed. Monday’s victory capped a tough week for Shorbagy. The final featuring two Egyptians was an impressive feat at a time when the Egyptian players – there were five in the MCO field – were worried about family members back home in a chaotic Egypt. Title sponsor and Suburban Collection CEO David Fisher praised the players for their concentration in the trophy ceremony. And then there was the draw itself - made tougher by new PSA rules that only seeded four players. 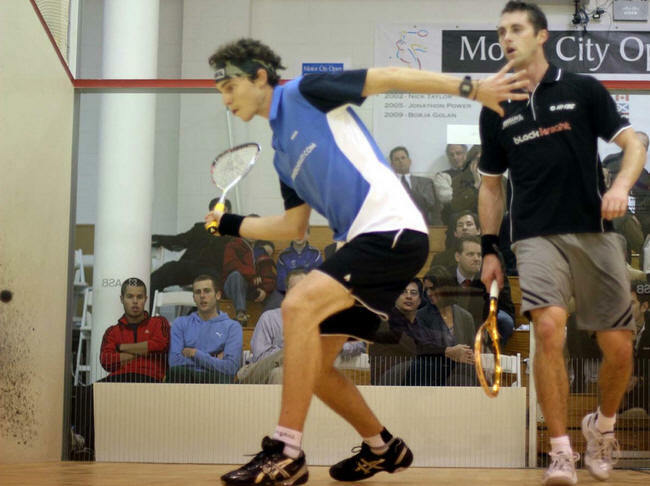 Shorbagy entered the tournament as the two-seed, and drew Borja Golan -2009 MCO champion and former world #10 - in the first round. 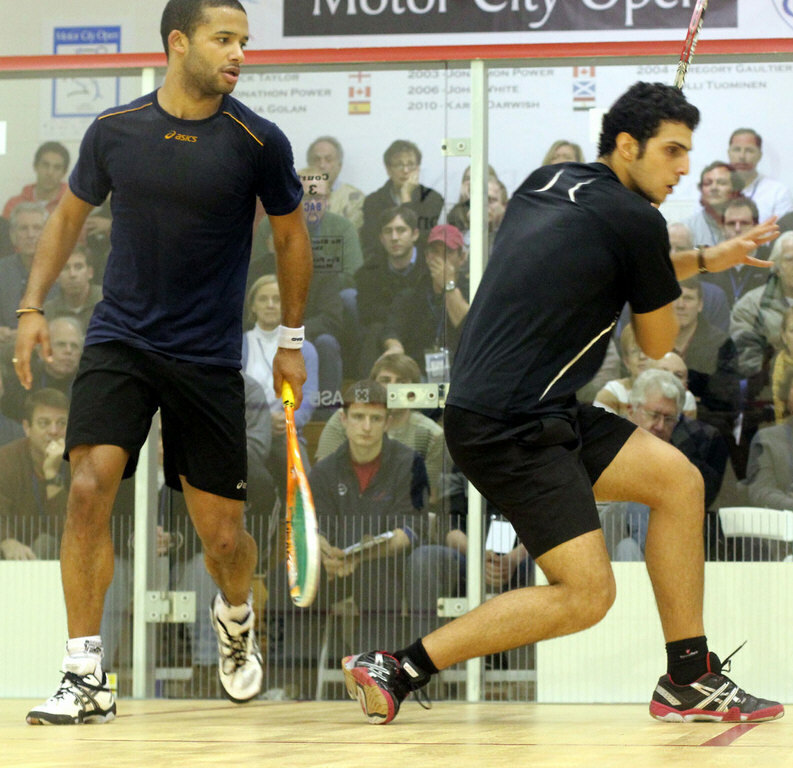 Waiting in the quarters was another Egyptian, the swift Tarek Momen, who had been a giant-killer in last year’s MCO. Then came ex- Motor City champ Palmer – on the downside at 34 of an extraordinary career – but still dangerous and eager to add a second MCO crown to his stuffed trophy case. Shorbagy was up to each challenge. Defeating Golan, Momen, Palmer and Mosaad in a single tournament. Winning an International 50 event at just 20 years-old. What’s next? 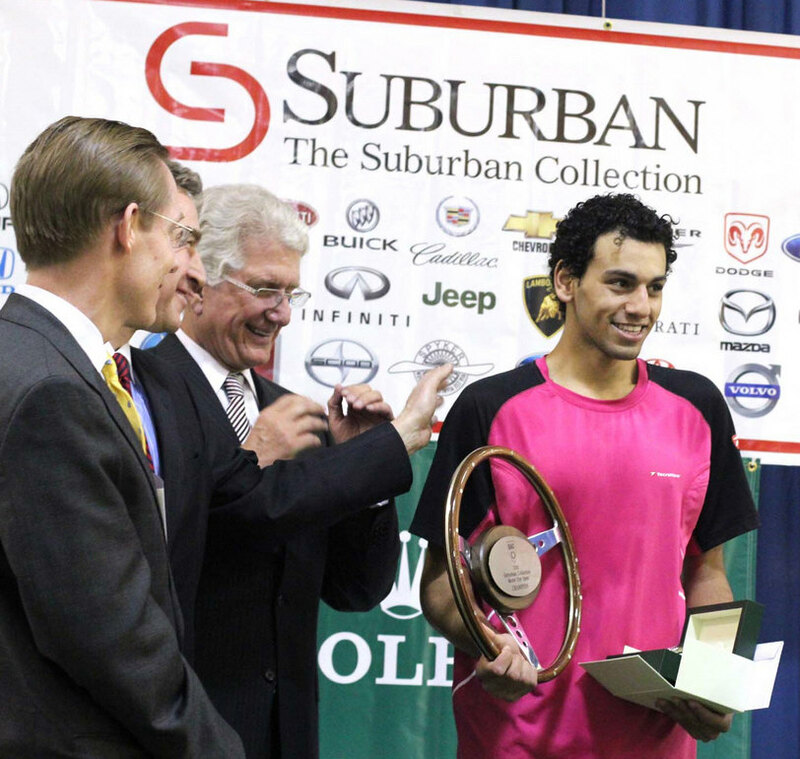 Experience gave way to youth Sunday at the 2011 Motor City Open presented by the Suburban Collection. Young guns Mohamed El Shorbagy and Omar Mosaad advanced past veterans David Palmer and Adrian Grant, respectively, to set up an All-Egyptian final. On another tense day for Egyptian youth in the streets of Cairo, Egyptian youth reigned supreme on American squash courts. Shorbagy and Mosaad will compete Monday night for a piece of the $50, 000 prize money and a Rolex watch from Greenstone Jewelers. Shorbagy, only 20 years old and ranked #9 in the world, held his own against the big 34-year-old Palmer – a former world #1 and current #16 – in a fast-paced affair that ended in a 3-1 (11-5, 4-11, 11-7, 12-10) result. It was the first time the two competed against each other, and the idea of playing against such a decorated squash player left Shorbagy in awe. For two games, the two big hitters sized each other up. Each game went quickly, one game each. “I didn’t have a game plan in the beginning,” Shorbagy said. “All I did know was that he has the best backhand volley in the world. So I was just trying to keep it away from him. 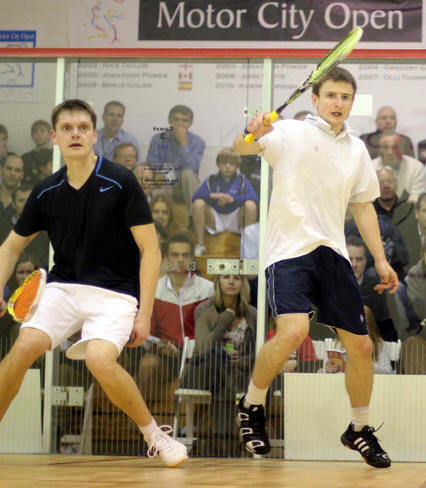 Indeed, games three and four were enthralling – the best squash of the tourney. Two top players at the top of their games. Drives, drop shots, lunging defense, spectacular kills, subtle boasts. It was textbook stuff and the capacity crowd at the Birmingham Athletic Club loved it. 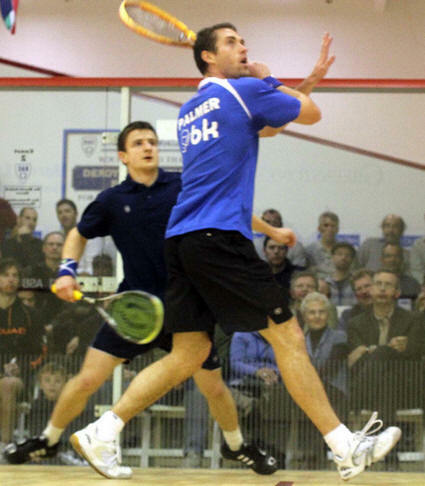 The crowd rallied behind Palmer at the end – eager to see a fifth game of this wondrous squash. But this was Egypt’s day. 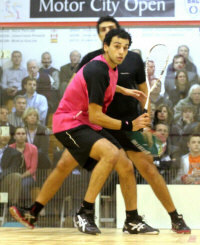 Shorbagy’s opponent in tomorrow’s final - countryman Mosaad – is big, 22-years old, and ranked world #15. And he held his ground against the physical, 30 year-old Grant, who was coming off back-to-back, five-game marathons on Friday and Saturday. The strain of those two matches - along with the fact that the Englishman is still is recovering from a hip tear - worked to Mosaad’s favor, as he recorded his first win against Grant in four tries. Monday’s final marks the third meeting between Mosaad and Shorbagy, with their series tied 1-1. 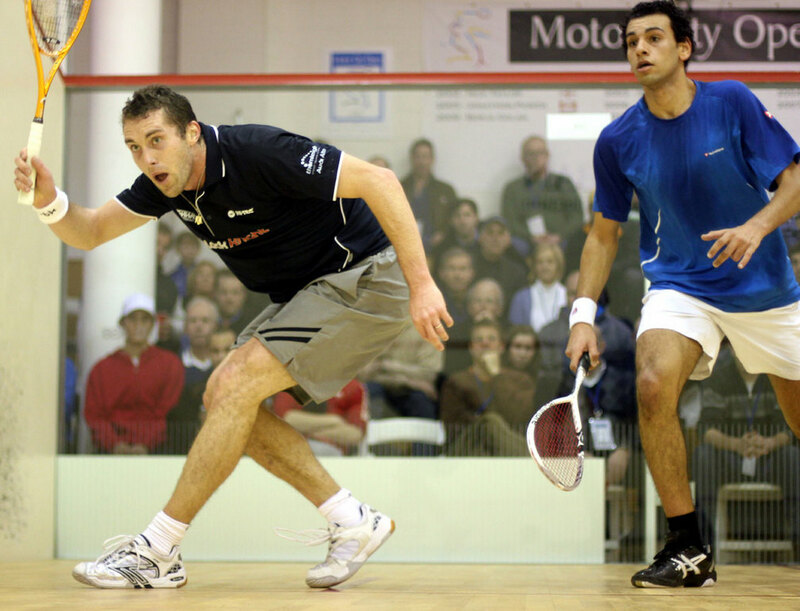 Shorbagy won in Spain in 2008 and Mosaad took the most recent encounter in Finland in 2009. England’s Adrian Grant has a knack for playing emotional, physically grueling, marathon matches at the Birmingham Athletic Club. 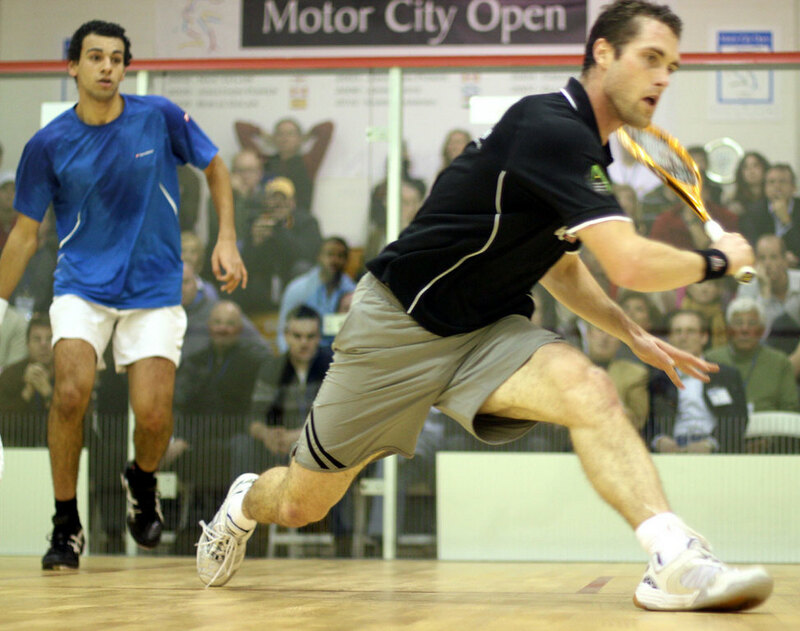 In the 2009 Motor City Open final, he suffered a deep scrape to his knee and took a racquet to the shoulder before falling to Spain’s Borja Golan in four games. 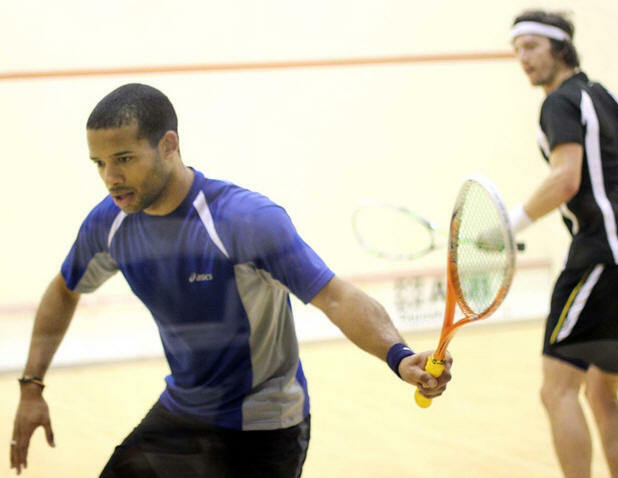 This year – 24 hours after outlasting Mohd Ali Anwar Reda in a two-and-a-half hour, five-game thriller – World #17 Grant was taken to the limit again by fellow Englishman, Jonathon Kemp. 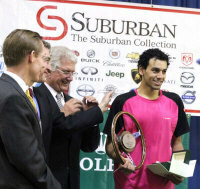 Grant came from behind to win in the quarterfinals of the 12th annual Open presented by the Suburban Collection. 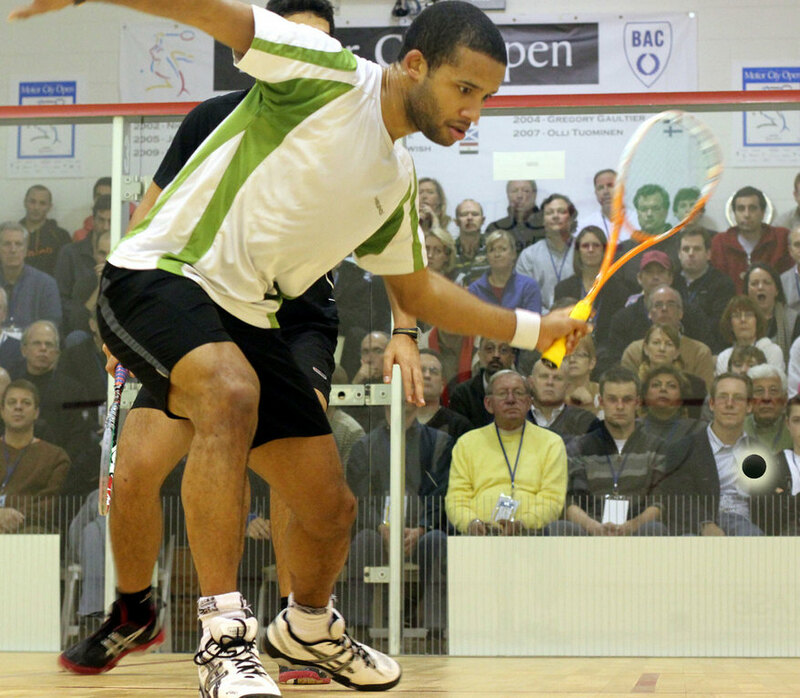 The favorites all advanced Saturday with veteran Englishman David Palmer and Egyptian youngsters Mohamed El Shorbagy and Omar Mosaad joining Grant in the semis. But none of the other semifinalists have had a match as physically taxing match as Grant’s - let alone two of them in two days. Grant - in only his second tournament back since suffering a five-centimeter tear hip tear that sidelined him for three months - acknowledged he’s only at about 80 percent fitness. He’s still working off the rust. He entered the MCO as the four seed, without any expectations other than playing himself back into form. His 3-2 (5-11, 16-14, 4-11, 11-5, 11-9) victory over Kemp - and his aggressive play on the court - showed his recovery might be further along than expected. Grant’s opponent in Sunday’s semi, World #15 Omar Mosaad, defeated the surprise Englishman, Tom Richards, who was looking for another upset after ousting top-seed Laurens Jan Anjema in Round One. Mosaad jumped out to early leads in each game forcing Richards to play catch-up. The big Egyptian eventually won in four: 7-11, 11-8, 11-8, 11-5. The other semi will pit Aussie David Palmer, a former World #1 and 2000 MCO winner, against Egyptian World #9 Mohamed El Shorbagy. At 34, Palmer is in the twilight of a great career, while the 20-year old Shorbagy is on the cusp of greatness. The rangy Egyptian won after fellow Egyptian Tarek Momen retired due to injury at the start of the third game. Palmer had little problem with qualifier Alan Clyne, World #51, as he cruised in three: 11-3, 11-9, 11-4. “I’m happy to win,” Palmer said. “This is the first time I’ve played him. He’s tough, he’s very fit, one of the fastest guys around the court. I thought I played pretty good, except for maybe a lapse in the second. I knew I really had to focus in the third game. It should be a dandy. Bloomfield Hills, Mich. – David (Tom, actually) slew Goliath in the opening round of the 2011 Motor City Open presented by the Suburban Collection. For the first time in the tournament’s 12 years, the top seed was ousted in Round One, as world #9 Laurens Jan Anjema fell in consecutive games to England’s World #30, Tom Richards. And though the other seeds advanced according to form, it wasn’t without more drama. Mohamed El Shorbagy (#2), David Palmer (3), and Adrian Grant (4), all advanced – but Grant was stretched to the limit against Egyptian Mohd Ali Anwar Reda in an epic 5-gamer that lasted over 2 hours. And in an opening round match-up that might have spelled trouble for the 2000 MCO champ, Aussie Palmer looked impressive in holding off countryman – and World #15 - Cameron Pilley. Unseeded Jonathon Kemp, Alan Clyne, Omar Mosaad, and Tarek Momen all advanced as well. Richards, in his first appearance at the MCO, stunned the crowd at the Birmingham Athletic Club with the ease in which he handled Anjema. The Englishman kept the tall Dutchman on the defensive throughout, scoring a quick 3-0 (11-7, 11-6, 11-7) victory. It was Richard’s first win over Anjema in four matches. Richards next opponent will be Omar Mosaad. 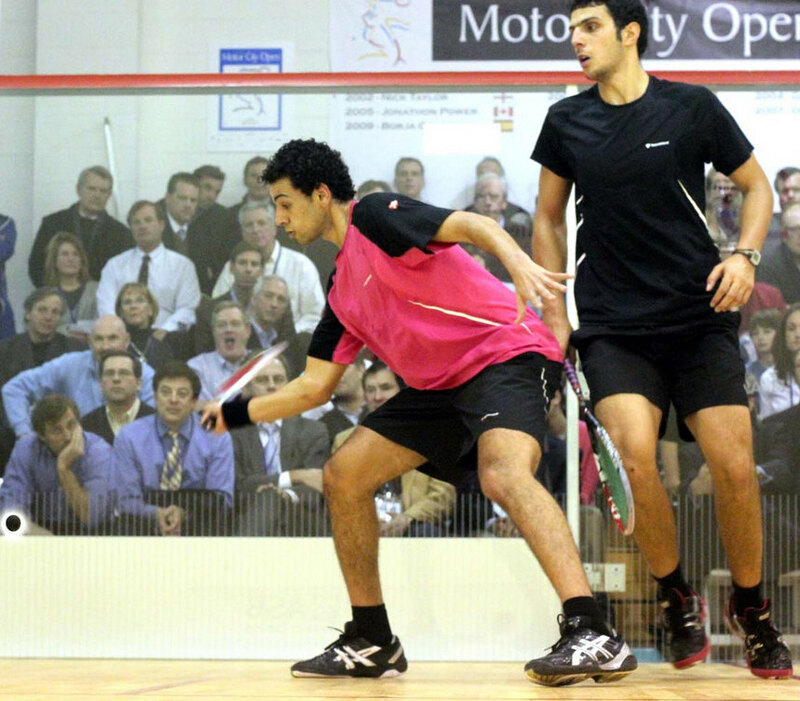 The 6’ 3”, 198-pound Egyptian looked in good form Friday, defeating Aussie Ryan Cuskelly 3-0 (14-12, 11-7, 11-7). Mosaad and Richards have met only once previously, with Mosaad the victor at the 2010 KIG Open. In other matches of note, Alan Clyne advanced to the quarters for the second straight year after defeating BAC Club pro and crowd-favorite Julian Wellings in three games, 3-0 (11-6, 11-7, 11-8). Despite the loss, Wellings - at 38, the tourney’s oldest entrant - played light on his feet and with superb shot placement. He had the sold-out crowd cheering loudly throughout. Two-seed El Shorbagy, just 20 years-old and already World #9, eliminated 2009 MCO champion Borja Golan 3-1 (11-8, 11-8, 2-11, 11-7). The defeat is a temporary pothole on Golan’s road back from seven months on the disabled list due to a torn ACL. The pair put on an exhibition of marathon rallies which, in previous years, might have resulted in El Shorbagy losing his patience. But a more seasoned, mature El Shorbagy maintained a slow pace and held back on forcing kill shots until he was 100 percent sure he had one. The tournament continues Saturday afternoon with the quarterfinals set to begin at 3 pm. 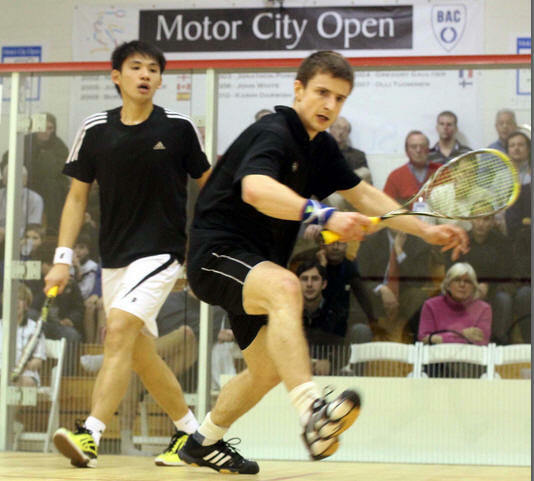 The top seeds held their ground and advanced out of the qualifying round Thursday night at the 2011 Motor City Open presented by the Suburban Collection. Four familiar faces to Motor City fans will be heading into Friday’s first round Main Draw. Each of the four — Mohammed Abbas (2004), Borja Golan (2009), Alan Clyne (2010), and Ryan Cuskelly (2007-present)—have competed previously at the Birmingham Athletic Club, with Golan having won the title in 2009. None of the four encountered much resistance Thursday, with Golan and Clyne each cruising 3-0 and Abbas and Cuskelly, 3-1. Abbas, world #38 and one of five Egyptians in the Big Show, opened the day against England’s Adrian Waller. Coming off a first-round bye, the slim Egyptian needed little time reacquainting himself with the BAC’s bouncy court. He jumped out to a quick 6-2 lead in the first game and - despite a momentary third-game lapse - was in control throughout. Abbas closed it out in four: 3-1 (13-11, 11-7, 10-12, 11-6). 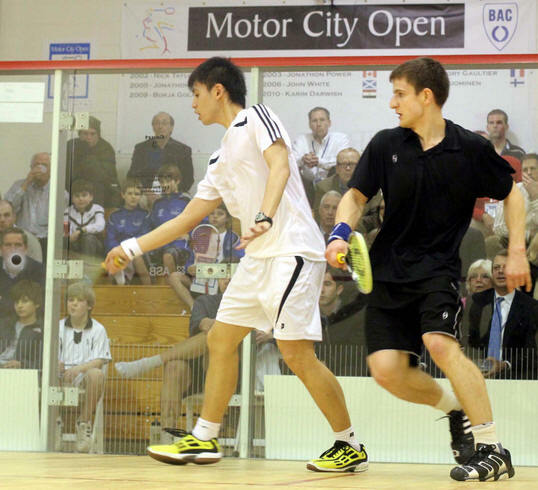 In a rematch of last year’s qualifying round, Scotland’s Clyne, world #53, outlasted Hong Kong’s Max Lee (#62) in three games: 3-1 (13-11, 12-10, 11-7). The games featured marathon rallies that worked against Lee, who struggled with his fitness. Lee squandered a crucial 10-4 advantage in Game Two..
Clyne also spoke of his key Game Two comeback. In the night’s final match, Spain’s Golan, world #31 and on the comeback trail from an ACL injury, defeated Christopher Gordon (world #74) of the United States: 3-0 (11-7, 11-3, 11-8. 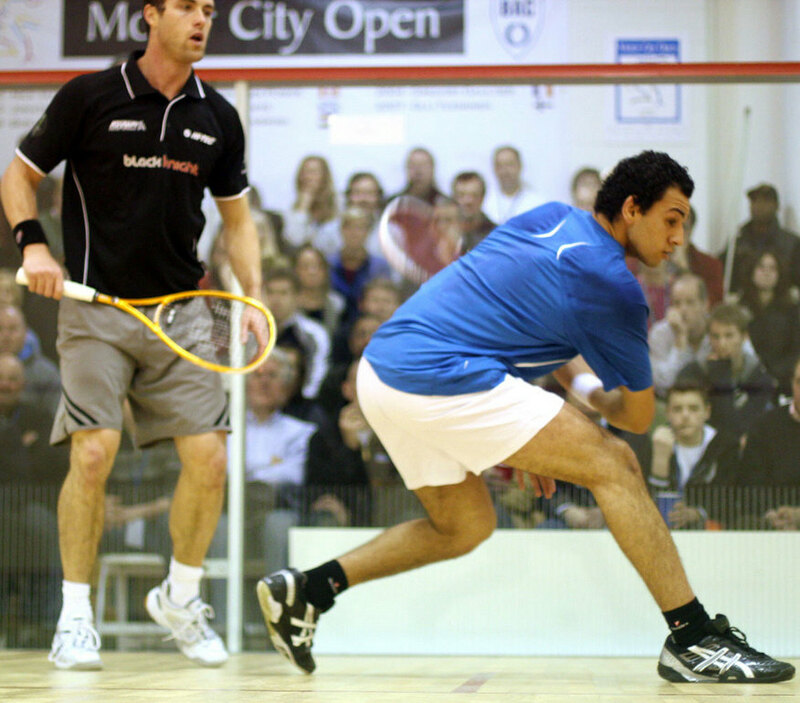 Looking to return to his 2009 MCO championship form, Golan enters Friday’s match against the #2-seed, Mohammed El Shorbagy, content with his improved performance. Aussie Ryan Cuskelly defeated Czech Jan Koukal in four games: 3-1 (10-12, 11-7, 12-10, 11-7). Friday’s opening round competition begins at 5pm on court 3. First round qualifying matches kicked off the 2011 Motor City Open presented by the Suburban Collection. 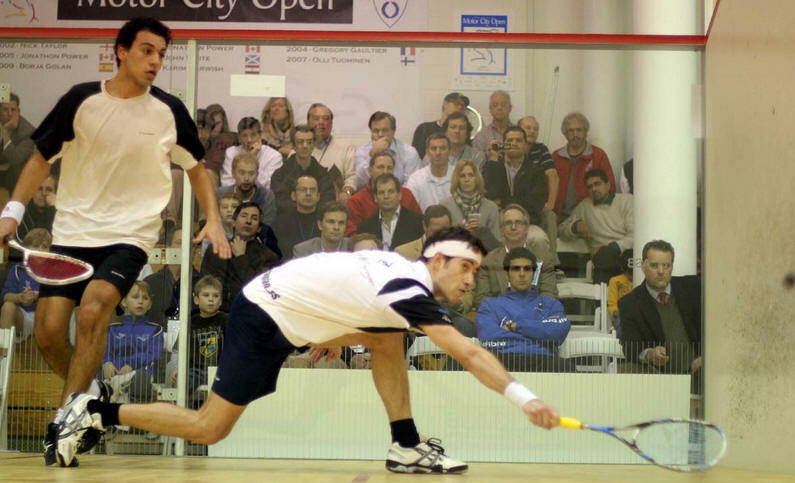 The tournament - in its 12th year and recently designated as an “International 50” event under the PSA's new tournament structure - features fifteen competitors ranked in the world’s Top 40, including two previous MCO champions, Spain’s Borja Golan and Aussie David Palmer. The Spaniard returned to the Motor City in the unfamiliar position of having to qualify for the Main Draw. Still recovering from a torn ACL that sidelined him for seven months and dropped his ranking from world #10 to #103, Borja has climbed back to #31 and is in search of the form that won him this tourney in 2009. 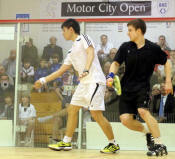 He showed signs of his old form in his opening match against 59th-ranked Gilly Lane of the USA. Golan cruised to a three-game victory, 12-10, 11-4, 11-8. But it was Max Lee (world #62) of Hong Kong whose return to the Birmingham Athletic Club stole the spotlight from Golan on opening night. Lee, who suffered a first-round exit last year to Alan Clyne, provided the night’s biggest upset by defeating World #39 Nicolas Mueller of Switzerland in four games: 5-11, 11-9, 11-7, 11-9. 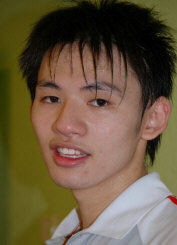 Lee countered the Swiss players aggressive, fast-paced style with tight shots and quick rallies. Just as Lee ended the night in dramatic fashion, Czech Republic’s Jan Koukal - World #54 - began the day with a come-from-behind, five-set victory over 47-ranked New Zealander Campbell Grayson. Koukal, recovering from the flu, dropped his first game 2-11 and failed to convert on several game point opportunities in the second, falling into an 0-2 hole. That’s when things started coming together. Playing on the defensive for most of the match, Koukal started moving better – countering Grayson’s attack. The Czech swept the next three games, 11-7, 11-7, 11-7. Scotland’s Alan Clyne (world #53) defeated MCO newcomer Stephane Galifi of Italy (world # 46) in three games, 11-4, 11-5, 11-9, England’s Adrian Waller (world #52) defeated Australia’s Zac Alexander (world #61) in straight games, 11-5, 13-11, 12-10. Australia’s Ryan Cuskelly (world #42) - in the evening’s tightest match-up according to world rankings - easily defeated American Julian Illingworth in three games, 11-5, 15-13, 11-4. And Christopher Gordon (world #74) of the United States defeated Canadian Keith Pritchard 11-7, 11-4, 12-10.